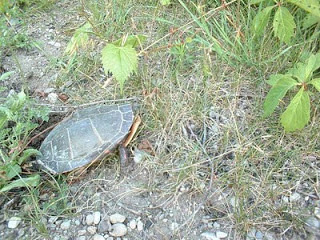 Here's an easy thing you can do that will benefit at local risk-turtles immediately. It's as simple as taking a different route to bypass Cootes and Olympic Drive. This small choice will mean turtles and other wildlife in Cootes Paradise will have a better chance of surviving from being crushed under your vehicle tires. Often you might not even be aware you've hit a young turtle, or a snake, for example, yet in the case of turtles, each death means this at-risk group is one death closer to extirpation. Turtles take a long time to reach maturity, and most hatchlings never make it to adulthood so you can see the dilemma. Please take a minute to pledge your commitment to use an alternate route, and help Restore Cootes and other groups do their part to protect our reptile friends. A previous survey showed that 70% of respondents would do this for the turtles. Hopefully you will join them!